It’s quite fascinating to think about the level of interest that people have with the life of a professional cook or chef and what it is like to work in the kitchen. If you perform a quick Google search “Books on life in the kitchen” you will see that there are over 220 million resources – amazing! Why is there so much fascination with who we are and what we do? I am sure that some other professions would yield similar results (although I doubt there are many), but still – 220 million? There must be something unique about the life that cooks lead and something special about those people who tie on an apron, sharpen a knife, and stand before a 700-degree char-grill day after day. I don’t have a clear answer for this, but I do know that cooks are intriguing and inspiring to me because through their time in the kitchen they are able to understand, adapt to, and appreciate many of the most important lessons that life can provide. Is it unique to kitchen work? I’m not sure, but since this is the only real work that I have known, the kitchen is my point of reference. There have been hundreds of people who have written about life’s lessons, and to a large degree there is commonality in their assessment. To each his own, these are the lessons that are most evident in the kitchen and most applicable to anyone seeking to live a fruitful life. Kitchens only function when the individual understands his or her role as part of a team. There exists a common set of goals on any given day in the kitchen that include serving a specific number of guests with quality food, of the standards expected by the chef and the property. With so many moving, interdependent parts in the kitchen, these goals can only be reached if each person accepts an assigned role and works in a collaborative way to meet them. A person can take many roads toward a chosen profession, but there is something innate about an individuals’ sense of accomplishment when he or she is able to make something that is tangible and enjoyed by others. Each day in the kitchen, a cook is given the opportunity to do just that. The end result is a sense of accomplishment that can be experienced by the maker and the recipient. More often than not – mistakes, accidents, and failure happen when a person or an organization is not prepared for what is before them. There is little room in a kitchen for poor preparation. It only takes one night on the line when things fall apart and chaos ensues, for a cook to refuse to put him or herself in that position again. Part of being prepared is taking care of oneself physically, mentally, and emotionally. Those cooks who fail to understand this (and there are many) suffer the consequences and put their team in jeopardy. The beauty of a kitchen team is that there is a built in support structure than can (when firing on all cylinders) perform triage on those who need a reminder about staying healthy. Not every cook enters the fold as a competent player. There are hundreds of skills to be learned in a kitchen – some are quick to learn, others take time and seasoning. However, everyone can start off on the same foot of dependability. Cooks learn quickly to show up on time (15 minutes early at least) ready to work and learn. Everything else can be taught. There is no tolerance in life for a lack of dependability. It sometimes seems that the mouth works a lot faster than the brain. Words are the most powerful tool known to man. The wrong, ill-conceived, inappropriate words, or simply too many words at the wrong time, have been known to be the downfall of many a good person. Due to the nature of the kitchen, cooks learn that when they speak, their words must be well thought out, concise and timely. The pace of the kitchen cannot tolerate anything but this approach that will serve that cook well – on and off the job. There is a great deal of rhetoric today about respecting each other for who they might be and what that may believe in. Some may feel that this can only be achieved through legislation, but history has demonstrated how unsuccessful this method is. Let people work together toward a common goal and you will automatically see how all barriers fall to the wayside. There are perfect examples of this in the kitchen, but also in sports, the military, and in organizations with a focus on helping others. Cooks learn that equality is a natural thing. Whether you work in the kitchen or not, a craftsperson of any type understands that a tool is only effective if it is respected and well maintained. In the kitchen, unlike many other fields, cooks own and care for their own tools. These tools provide them with the ability to perform at a certain level and as such must be cared for every day. This is a great life lesson. Quality first should be, and in most cases is, the mantra of professional cooks everywhere. Every plate of food that leaves the kitchen carries the signature of the cook, the chef, and the restaurant. When a guest does not feel the quality is there, then the fault lies with every cook, chef, and restaurant employee. No matter how small or large the task (mincing shallots, filleting fish, reducing a stock into a finished sauce), cooks learn that if they are assigned the task, it must be done to a standard of excellence. Even off the job, it is rare to find a professional cook waiver from this in life. To be truly happy, people need to live by a philosophy or belief structure that is uniquely theirs. A persons “stakes in the ground” define who he or she is and allow that person to look in a mirror each morning. When you see a cook who has worked in a particular kitchen for a number of years, it is typically because there is some level of philosophical match. When the match doesn’t exist, then cooks tend to be constantly looking for that next gig. To say that individuals should not sweat the small stuff is to ignore the systemic impact of the small things in life. Little things can bloom into major challenges in life. Ignorance of a small comment can destroy a friendship, ignoring an overdue bill can impact on a persons’ credit score, failure to maintain a well groomed look can impact on a persons’ ability to land that next job, etc. 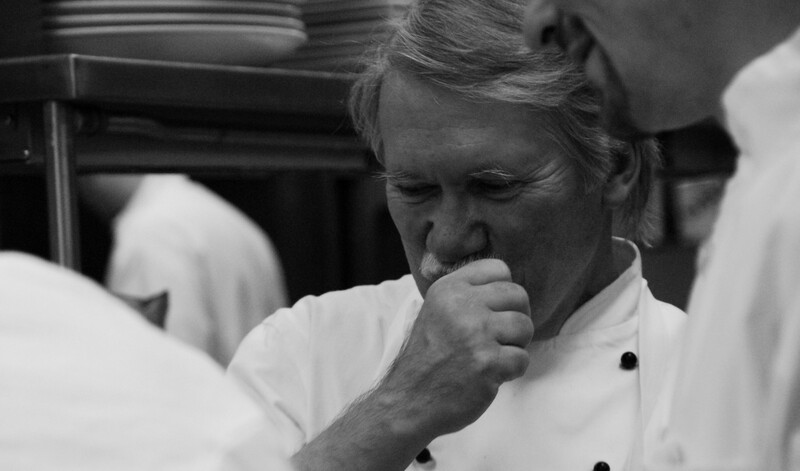 In the kitchen – cooks learn to appreciate those small things and their impact on the whole. Cleanliness, mise en place, dry towels vs. wet towels, chipped plates, properly chopped parsley, hot plates for hot food and cold plates for cold food are all small factors that impact the experience of the guest, the pride of the cook, and the success of the restaurant. Yes, we are all worth more money than we receive. This is a far better situation than being paid too much for what we do. The way to advance your career is to always remain an over-producer. Successful chefs, managers, and restaurateurs are almost always individuals who give more than they get. This same attitude can apply to any profession, to relationships, to family, or to friendships. Sometimes pride is given a bad name. When we do something well it makes us feel good. In fact there are few things in life that make us feel better than the pride that is evident through our work (directly or indirectly). When a great plate of food leaves the kitchen – we feel pride. When a guest says that they had a great experience – we feel pride. When we master a new skill for the first time – we feel pride. The same can be taken through life outside the kitchen: when our children accomplish something – we feel pride because we had a direct or indirect impact on that result. Reaching for excellence, dedicating our time to approach every task with enthusiasm, and knowing that we helped to accomplish something is certainly worthy of holding our heads high with pride. A lack of pride in the kitchen or in life is a result of people unwilling to give the right amount of effort. It is a lack of pride that is a problem in life. Many thanks for your post; helping all of us to better understand what we feel and are not able to put into words.